No. 88, Block E, Lot 546, Subang Light Industrial Park, Off Jalan Subang 2, 47500 Subang Jaya, Selangor, Malaysia. 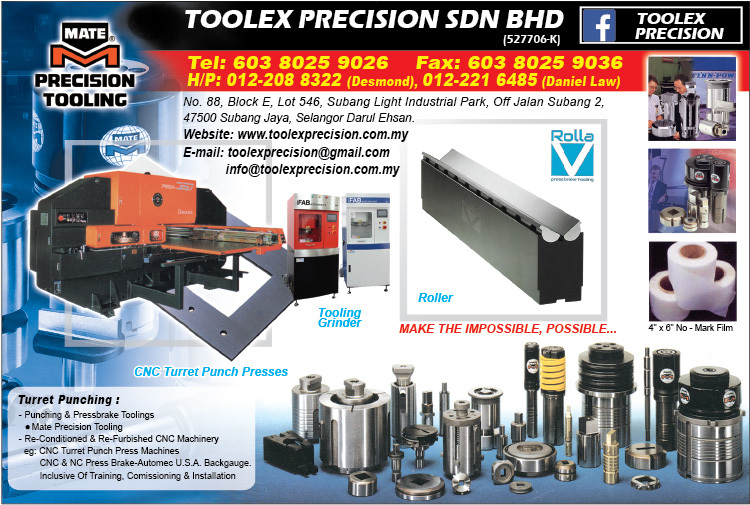 Toolex Precision Sdn Bhd a ‘ONE STOP TOOLING SOLUTION’ Precision Tooling company located at Subang Jaya Light Industrial Park, Selangor D.E. Malaysia. We understand our customer’s expectation and strive to provide a one-stop solution for all their concerns. As we are firmly convinced that the main focus of our work must always be on customer service and benefits, our entire team is always eager to fulfill all customer requests and needs within the shortest possible time. Take our word for it and give us a try! Precision and quality can only be achieved with well trained and highly motivated employees. Therefore we spend a lot of time in the training and experience of our employees. Since 1994 we established a tremendous know-how in the production of precision and punching tools. The creativity and the commitment of every single member of our team provides the perfect condition to accomplish all the problems and technical challenges our customers might face us. Our experienced team demonstrates on a daily basis that our activities are always focused on our customers’ requests and needs. We demand of ourselves the highest standards of individual and corporate integrity. We safeguard the company assets as well as those of our customers, suppliers and the community we serve. We comply with all the company policies and laws as well as those of the society. We live by the letter and spirit of Integrity. On our consistent emphasize on ‘Total Customer Satisfaction’, we work very closely with our valuable customers to provide solution and design, especially to reduce cost by new design of Special Tools solution and used of HSS steel material for longer tool life.